ObamaCare was intended to lower the costs of healthcare. In fact, one of the many broken promises of President Obama was the impact his new healthcare legislation would have on the rising cost of healthcare. 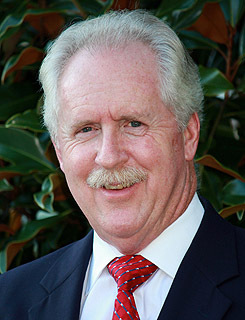 This deception was based on the fact that in the final year of the 10 year projection used by the Medicare actuary to score the plan, the rate of growth in health spending under the Senate bill (essentially the version signed into law) would be slightly lower (6.9%) than under the status quo (7.2%). However, these projections were largely based on robbing from Medicare ($716 billion over the next ten years). At the time ObamaCare was passed, these promises were pure speculation. Today we can analyze how close they came to reality. 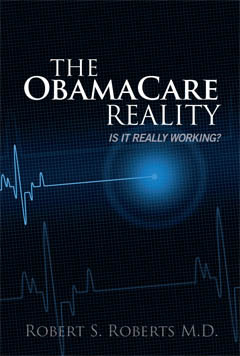 Joseph R. Antos and James C. Capretta, writing in The Wall Street Journal, can now tell us that ObamaCare failed to contain costs. Whether you interpreted “bend the cost curve” to mean lowering actual costs or merely lowering the rate of growth of costs, by either standard ObamaCare has failed. In their report they say America’s healthcare spending rose 4.3% in 2016. That is the third straight year it outpaced economic growth. 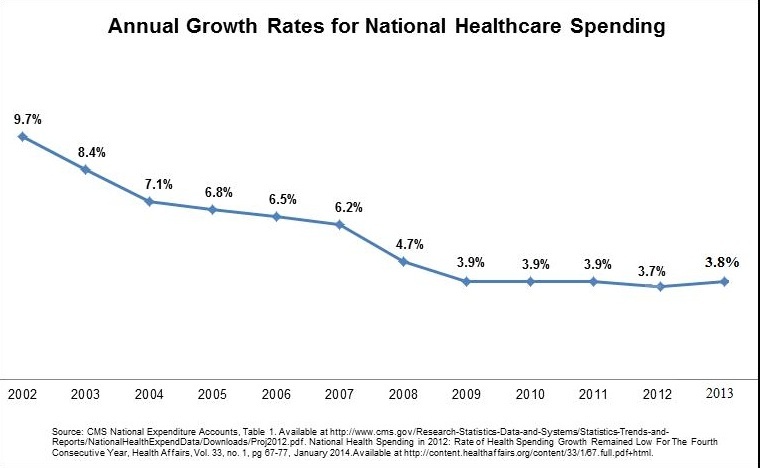 Total health spending last year was 17.9% of GDP, up from 17.2% in 2013. The above graphic depicts the Annual Growth Rate for National Healthcare Spending, according to the Center for Medicare and Medicaid Services (CMS), from 2002 to 2013. This reflects the period just before implementation of ObamaCare in 2014. 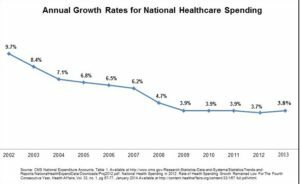 You can see from this graphic that the rate of growth of healthcare spending was declining from 9.7% in 2002 to a low of 3.7% in 2012. But since this graphic, the rate of growth of spending is now in the third straight year of growth after implementation of ObamaCare; currently at 4.3%. What accounts for this cost control failure? 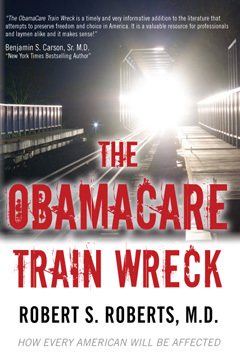 The cost control provisions of ObamaCare simply have failed to pan out. Accountable Care Organizations (ACOs) were supposed to give hospitals and doctors incentives to become more efficient and cut Medicare costs. In 2016, only 56% of the 432 ACOs hit their benchmarks for reducing costs. Even worse, after taking into account their bonus payments, ACOs actually increased Medicare spending, by $216 million in 2015 and $39 million in 2016. In other words, programs that were supposed to save money actually spent more money! Perhaps ObamaCare’s greatest possible cost control is one that both Democrats and Republicans want to repeal. It is referred to as the Cadillac Tax. This provision of ObamaCare is intended to reduce costs by imposing a 40% excise tax on “Cadillac “ insurance policies offered by employers – specifically on any premiums that exceed $27,500 per year for family coverage. The idea was to give employers an incentive to cut costs. But unions objected because these policies were part of their contract negotiations and they successfully lobbied for this provision to be delayed until 2018. Republicans would also like to kill this provision in the law. “bent the cost curve” – but it bent it in the wrong direction.